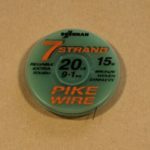 Many pike anglers make their own wire trace rigs to suit a method, or size of bait, using their preferred trace wire and hooks. Traditionally trace wire was twisted to attach the hooks and swivels. Now building rigs using crimps has become very popular. Pike trace wire is made of several strands of fine stainless steel wire, woven into a single strong flexible line. 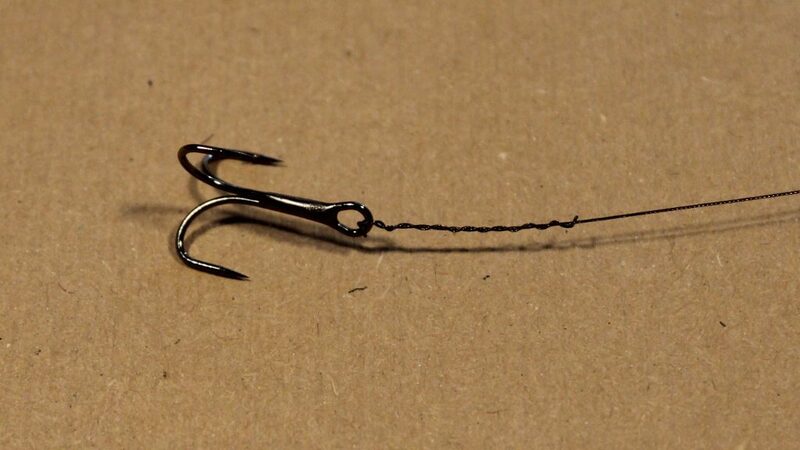 Modern coated Pike wire is ideal for making rigs using crimps. 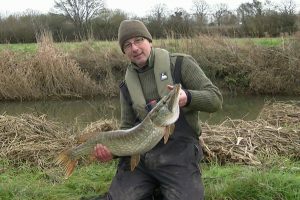 Traditional uncoated, multi strand Pike wire is good for hand tied twisted rigs. Trace wire is available in various breaking strains, 20 to 24lb is a good all round strength. 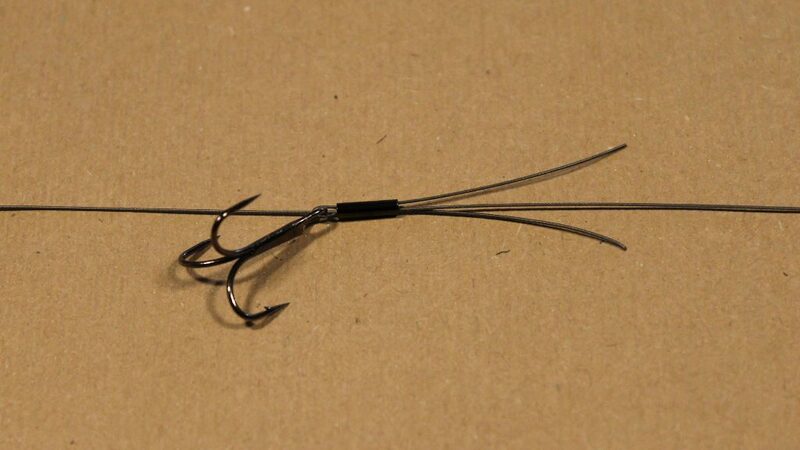 For a small to medium bait like a whole Smelt or a mackerel tail, use size 6 hooks on a trace wire 18 to 24 inches long. Start with a 30 inch length of trace wire. Slide on a crimp, then thread the first hook onto the wire. Push the end back through the crimp forming a loop with the hook inside. Close the loop down by pulling the slack out through the crimp, tightening loosely to the hook eye. Once your happy, squeeze the crimp down with crimping pliers. 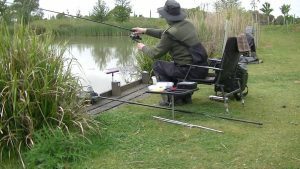 If you leave any tail sticking out it may get caught on the cast causing a tangle or poor presentation. Cut off any excess. To make the join even tidier you can slide a rig sleeve over the crimp. The crimps come in different sizes to fit different diameters of trace wire. Make sure the crimps you are using are the correct size. 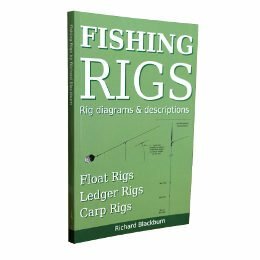 With a twisted wire rig, thread your uncoated trace wire, twice through the eye of the hook. Allow three inches of tail end for twisting. Clip a pair of forceps to the tail and twist around the wire just once. Give the forceps a good pull to tighten the knot down, then put a further eight or ten twists by spinning the forceps around the trace to finish off. Cut the remaining tag end off and cover with a rig sleeve, if you like. With a crimped rig the second hook can be attached with a separate piece of trace wire. Thread the hook onto a short piece, hold the hook halfway along and fold the piece of wire double. Thread both ends into the crimp and squeeze the crimp in place. Trim the ends close to the crimp and cover with a rig sleeve. To twist the second hook on. Thread a hook onto the wire, lay the wire along the shank of the hook, then wrap the wire down and over the bends of the hook. Twist the wire up the shank three or four times and pass the wire back through the eye and pull tight. The distance between the two hooks is dictated by the size of the dead bait. Here I intend to use a whole Smelt or half a Mackerel, so I will set the hooks three and a half to four inches apart. To provide a connection to the main line a swivel is tied to the end of the wire trace. 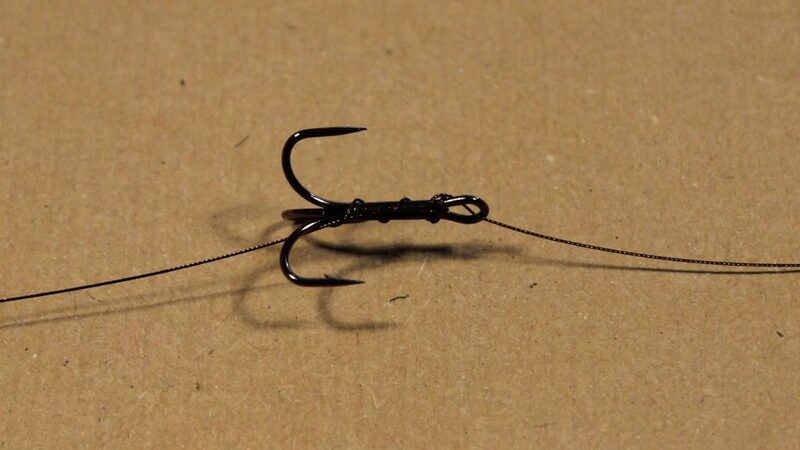 Use a good quality swivel in size 7 or 9, rated at 60lb plus. Please don’t use a swivel of unknown strength. Lastly, squash down two of the barbs on each of the hooks. The third barb on each treble is left untouched. 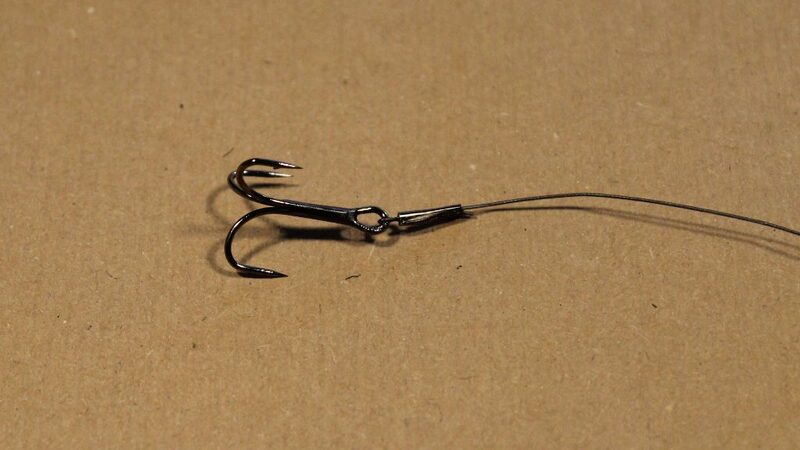 This hook is used to attach the dead bait, the barb will help to hold the bait on the hook. The rigs are now finished and ready to use.